Marion Cunningham’s death is a sad occasion, one that’s fostered many loving tributes from distinguished food writers like Kim Severson and Michael Bauer. 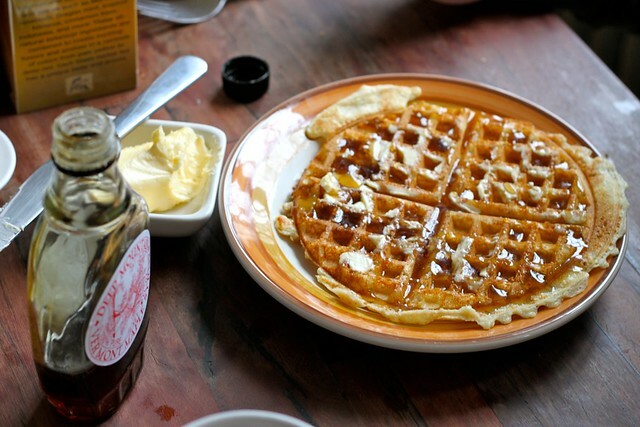 Many of these tributes make mention of her recipes, in particular her raised waffles (which I’ve made before, see picture above) and her baking powder biscuits (which I haven’t but plan to make right away). Similarly, at Nora Ephron’s memorial service, ushers passed out copies of her favorite recipes (for tzimmes, for brisket, for egg salad) as a way to remember her. These recipes aren’t like letters found in a shoebox or dusty pictures hanging on a wall. Most artifacts from someone’s life are inanimate, frozen-in-time. Letters and pictures don’t ask anything of you; recipes do. To follow a recipe, you have to go food shopping. You have to get out your cooking equipment. You have to pre-heat the oven. You have to prep your ingredients. Most importantly, you have to conjure forth—patiently, carefully, thoughtfully—a specific taste that replicates, in some way, the taste captured by the recipe author when they wrote down those words. Recipes are unique in that they produce real sensations: the scent of those biscuits baking, the sound of the raised waffle sizzling on the waffle iron, that familiar, comforting taste of meatloaf. These sensations mirror sensations from the life of the recipe author; that biscuit-y air you’re breathing is the same biscuit-y air Marion Cunningham breathed when she first baked those biscuits. While charlatans across the centuries have duped mourners into paying good money to connect with the dead, recipes work a similar magic without the flimflammery. You really can revive a person’s spirit after they die, you simply have to turn on your oven. Of course, not every recipe left behind is worth making. There are plenty of people whose parents are gone who have absolutely no desire to recreate the food from their childhoods. Not everyone is a great cook; not everyone can leave behind a quality recipe. Which is all the more reason to celebrate the ones who do. It’s also a motivation for those of us who are still alive to think about our own recipe legacies: is there a dish we want others to cook as a way to remember us? For me, that might be scrambled eggs with sour cream, scallions, pickled jalapenos and cheddar. Or maybe my recipe legacy has yet to be written. Language around death is often forced: “It was his time to go,” “she’s off to a better place,” “at least he didn’t suffer.” Words don’t satisfy the deep questions that echo within us when we’re confronted with the inevitable. Your best bet, then, is to wander into your kitchen on Saturday night, just before you go to bed. Get out a big bowl, add milk, melted butter, sugar, flour, stir it together, cover it with plastic wrap and leave it out overnight. On Sunday morning, heat your waffle iron, brush on more melted butter and pretty soon you’ll be eating Marion Cunningham’s raised waffles, preferably doused with good maple syrup. Questions of death will feel entirely inappropriate as you sip your morning coffee, flip through the Sunday paper, and enjoy the tangy taste, the delicate crunch of the raised waffle. That’s as it should be.